Charoite is a rare mineral, named for the Chara River (though this etymology is disputed by some), and found only in the Sakha Republic, Siberia, Russia. It is found where a syenite massif has intruded into and altered limestone deposits. Charoite is a strong, translucent lavender to purple in color, reminding some of a granite or marble with its pearly, swirling luster. However, it is a discrete mineral rather than a rock. Charoite is strictly massive in nature, and fractures are conchoidal. It has an unusual swirling, fibrous appearance, sometimes chatoyant, and that, along with its intense color, sometimes of a "grape" nature, can lead many to believe at first that it is synthetic or enhanced artificially. Though reportedly discovered in the 1940s, it was not known to the outside world until its description in 1978. It is said to be opaque and unattractive when found in the field, a fact that may have contributed to its late recognition. 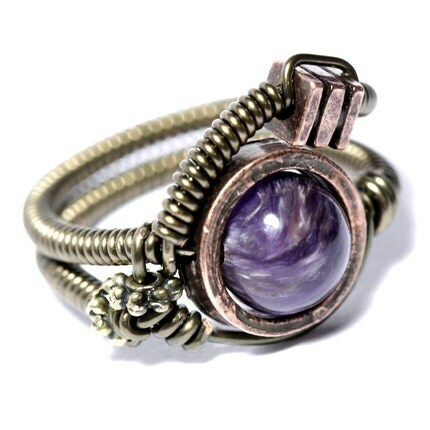 Charoite is used as an ornamental stone and sometimes a gemstone, generally as cabochons set into pendants. Russia has fairly strict prohibitions on the exportation of charoite. Generally, charoite is permitted to be exported only after the stone has been worked, for example, into figurines or other type ornaments. It is therefore difficult to procure "unworked" or "rough" charoite in a form suitable for further working into jewelry such as cabochons. Charoite often contains inclusions of the mineral tinaksite, which appears as a golden, spire-like shape running through the material. "Stone of Transformation" Convert anger and fear to positive emotions. 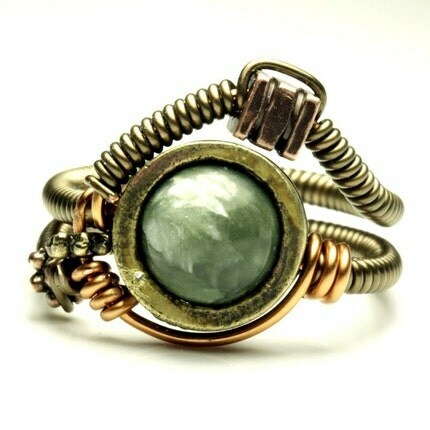 I really like this new material it reminds me of SERAPHINITE because of it's chatoyancy and mysterious nature . wow, these ARE cool. What's the non-stone material? And how do you take those amazing pictures! Both are beautiful! My favorite is the green one. Beautiful! I'd love to see a photo of your treasure box! Fantastic rings. That purple one is my favorite! Your designs are wonderful and those photos - wow!